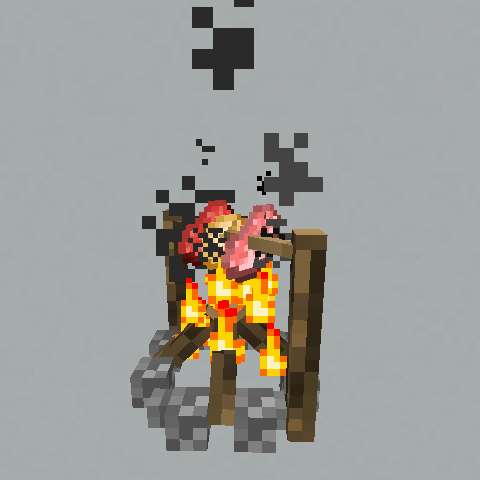 This is an addon for Tough as Nails, which adds a cooking spit which can be placed on the top face of the campfire and right clicked with uncooked food. If the campfire is active/burning, it will cook the food over time. what is the recipe of this things? Hello,This mod is very good! I want to repost this mod to MCBBS, The biggest minecraft forum in China.And I will translate it to Chinese,then I will sent you.I hope to hear from you soon! Whenever a raw meat object on the spit turns to "cooked" it is also creating 2 gold ingots for every unoccupied slot on the spit. So it's like a carnivorous money tree. Maybe some recipe config options might help? I think the challenge with relying on recipes from mods is they can get pretty unpredictable, so maybe even a whitelist option in the config might help to keep it simple (with default whitelist config settings for vanilla/common raw meats etc). That's... odd. Do you have another mod installed? I can probably fix it regardless by not allowing blank items to have a result. As for a white/blacklist, that is a good idea, some items you might not want to cook even though they are food. I've added a new file that should have these features and fix that bug, tell me if it doesn't work. Is this compatible with other mods like pams harvestcraft, and animania? Looking at the source code, it appears to based off whether the item is a food or not and if it can be smelted. Yep, there are no custom recipes it just uses furnace recipes that have a result that extends ItemFood. hm interesting, I assume this is because when I am checking if it is food or not I'm messing something up. I will look into this. Hm can you try it with just TAN and this mod? I'm not having the stone thing, though I am going to fix the metadata issue. Right clicking with sticks does nothing for me. have you considered a config option as to what can light a campfire and what percentage of chance it has? Are you sure both mods are updated? I just released a new file yesterday. The campfire is not my block it is from Tough as Nails so I don't know why it is behaving in that way. I don't believe I am modifying its behavior. Tell me if you have the latest version and it still is named incorrectly. OK I fixed the naming issue, I will upload the file now.